Pilgrim’s Professional Residential Roofing Repair Service Located in Taylor, Michigan, we have provided exceptional roof repair service to the Michigan Downriver residential area, along with the Southeast, and Metropolitan suburbs since 1979. We are a customer-driven roofing repair company that values your patronage and focuses on delivering an outstanding permanent roof repairs service every time. Over 55 Years Combined Experience! Downriver’s Leading Roof Repair Specialists! Key Points of Our Business • No One Beats Our Personal Guarantee! • Reliable Michigan Residential Roof Repair company • Family Owned and Operated In Taylor MI. Since 1979 • Uniformed and Educated roof repair Experts • Permanent Roof Repair Solutions • Industry-Leading Materials • 55+ Years Combined Roof Repair Experience • Customer-Driven Business • No Tar Used in Our Roofing Repair Jobs EVER! No One Beats Our Guarantee! Roof Repairs Are What We Do! All Residential Roof Leak Repairs Guaranteed! Call for Your Free Estimate Looking for Roof Repair Experts for your Southeast Michigan, Metro Detroit, or Downriver home? Call Pilgrim’s Professional Roof Repair Services. From the moment you meet Mr. Butch Pilgrim, you will know you are in good hands, and your repair will be done right. Best of all, It’s Guaranteed. (734)374-8756 Call today! Servicing Michigan Downriver & Tri-County Area Residential Roof Leak Repairs Since 1979 Pilgrim’s Roof Repair proudly services Wayne, Macomb, and Oakland County cities of Taylor, Southgate, Allen Park, Dearborn, Dearborn Heights, Lincoln Park, Melvindale, Wyandotte, Trenton, Riverview, Belleville, Woodhaven, Brownstown, Grosse Ile, Carleton, Flat Rock, Newport, Rockwood, South Rockwood, New Boston, Romulus, Southfield, Westland, Garden City, Livonia, Plymouth, Canton, Gibraltar, Royal Oak, Birmingham, Farmington, Farmington Hills, and surrounding areas. 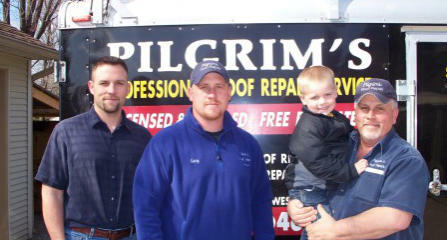 Business Hours: Mon - Sun 8 a.m. – 7 p.m.
© Pilgrim’s Roof Repair Service. Roof Repair Is What We Do!